Stand out from the competition with our Signs In Motion. Our Signs In Motion allows you to place your Clients large format digital banner messages or images around the entire 360 degree circumference. Add Animation To Your Next Event Or Promotion.This combination tent and rotating inflatable has captured the attention of many around the globe. This patented combination inflatable and rotational device allows an inflatable to spin horizontally 360 degrees. 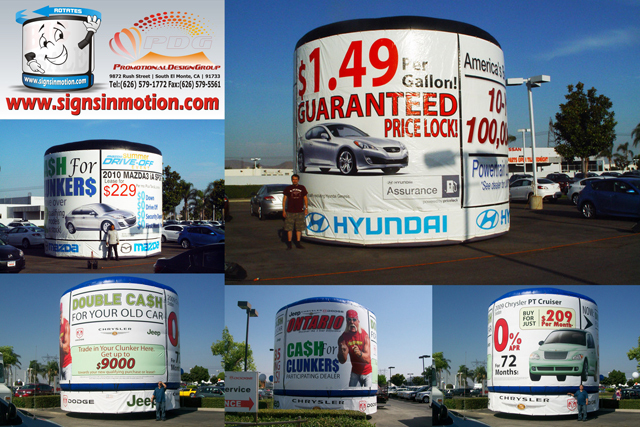 A Compact Solution To Your Huge Advertising Needs. Whether indoors or outdoors, the ‘Mini-Rotatables’ will continuously spin your featured promotion, product replica, event or text message 360 degrees! In a recent study by Product Acceptance and Research in Washington D.C. , Motion Signs were found to be extremely effective in driving sales. 94% Motion Sign recall. 80% recalled the specific advertisement. Motion Signs resulted in an increase in sales of 107%. New & Innovative: This new and Innovative form of Advertising provides a new alternative to static signs giving you the most Effective Advertising Tool available. An Effective and Economical way of getting your message to a large Target Audience. Mobile- Allows you to move and strategically place Signs In Motion on almost any level surface (Grass, Asphalt, Cement, Dirt) in order to maximize visibility. Satisfied Clients: The ultimate goal is to keep your clients Happy and Satisfied. Signs In Motion will certainly and most importantly strengthen your relationship with your client long term. Repetitive: Seen over and over again by your target audience. Image recognition begins and Festival and Event attendees remember your message or image. 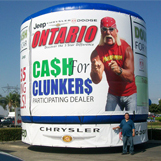 Daunting Size: Banner Messages or Images are impossible to miss because of the enormous size of the Sign In Motion. Great Branding Tool for Festivals and Event were there’s a heavy concentration of attendees. Sizes Available-There are 18 different sizes available. From 5’ tall by 10’ diameter to 35’ tall by 62’ diameter. (See Price List for more details). Manufactured in the USA-All Signs In Motion and Large Format Digital Banners are Manufactured in the United States by SignsInMotion. Impressionable: Initial Impression is usually Wow! Signs In Motion distinctively creates an environment that will captivate audiences and leave an everlasting impression. Maximizes Return On Investment: This Unique form of Advertising maximizes the return on your investment. Target Audience: Great for targeting a specific demographic. No longer limited to Static Images of print ads and expensive Billboards. You can now benefit by using a new and alternative advertising medium (Signs In Motion).